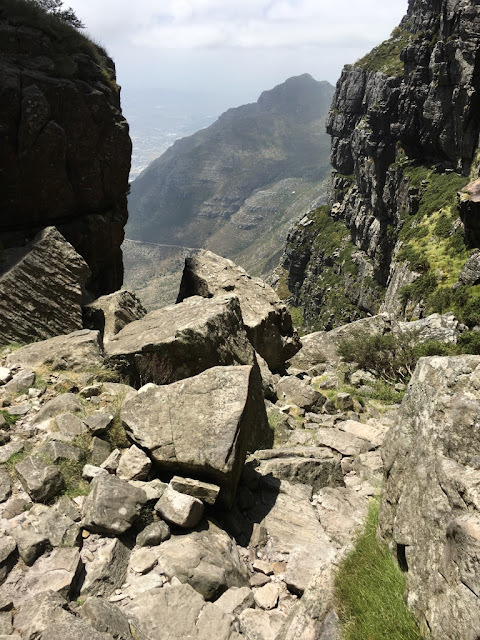 I'm guessing that most bloggers who write about South Africa eventually share details with their readers about visiting Table Mountain in Cape Town. Table mountain is an iconic and awe inspiring mountain which keeps watch over the city. It appears and disappears from view multiple times per day as the fog rolls in and out. There are two ways to get to the top. You can hike up or you can take a cable car. 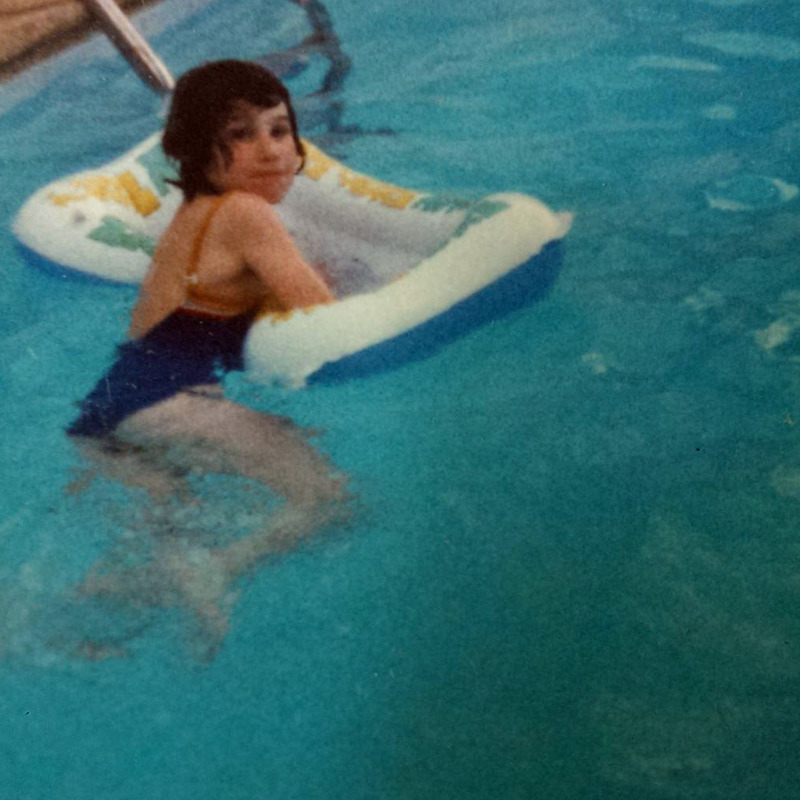 This blog post has a little bit of a different spin to it than most on this topic because in large part, this post is about how Mr. 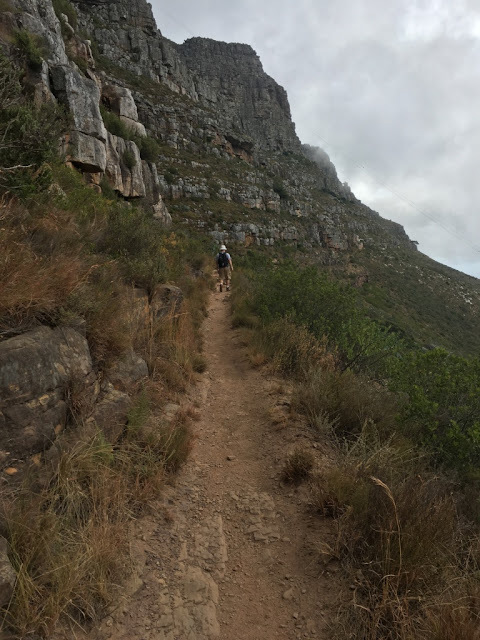 Deep and I didn't make it to the top of Table Mountain on our first try. Instead we got "off trail." Which is how we hikers like to describe getting lost. 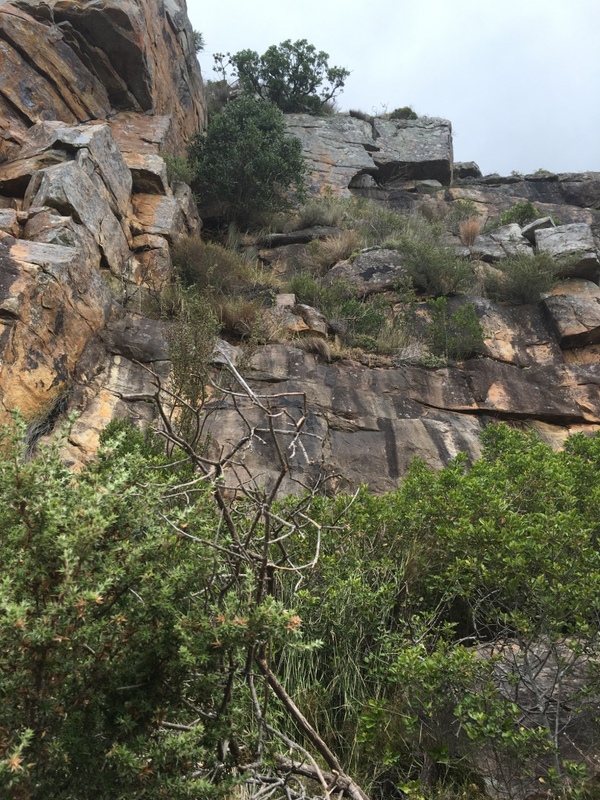 If you have hiked up Table Mountain yourself then you might be wondering how in the world we possibly got "off trail?" It's a fair question. I will get to the details of this mishap shortly. But first a bit of Deep family hiking history. Getting lost while hiking is somewhat of a pattern with us and in retrospect it's due to a personality flaw we both have. Mr. Deep and I are very different and normally our personalities balance each other out, but every now and then we both tend to get a little over excited and when that happens we both lose our of sense of methodical planning and we just go. And that's when we get into trouble. The first time we got lost while hiking we were in Lake Tahoe, California hiking with my parents. Specifically, we were in Squaw Valley and we wanted to hike up to the top of a peak where a pool, restaurant and bar were located. 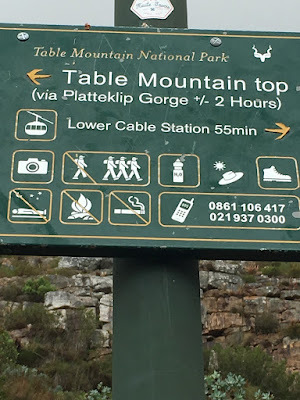 Similar to the Table Mountain episode, there was a cable car available to take people up to the top and similar to the Table Mountain experience we scoffed at the idea of taking the cable car. We pride ourselves on our level of fitness and our sense of adventure, sometimes to our own detriment. On that occasion, the four of us ended up scaling the face of a mountain an in effort to reach the top. When we finally emerged from the woods and reached the resort we were covered in dirt and looking haggard. The staff at the resort at the top were so surprised (and we like to think impressed) to learn that we had hiked all the way up that they waived the entrance fee and we got to hang out at the pool for free. 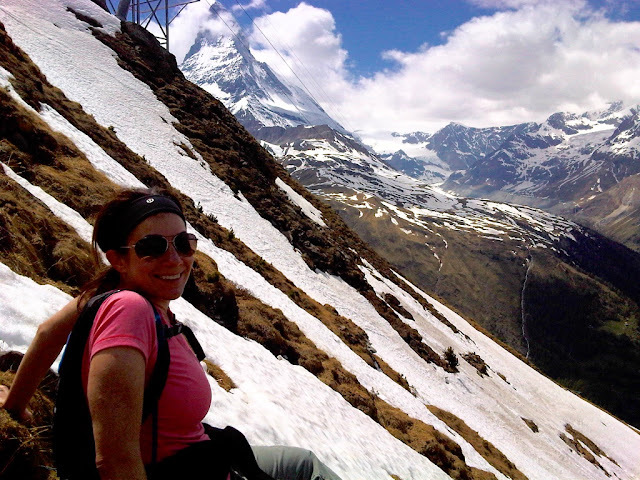 Another time, in Zermatt Switzerland Mr. Deep and I went for a hike in the Alps. Everything was going fine until we lost the trail due to massive amounts of snow at the higher elevation (it was May.) We ended up trudging through waist deep snow up the side of a mountain. The hills were alive with the sounds of our complaining. Then, the snow lessened but the mountain became so steep that we had to crawl on our hands and knees. We had to rest every few seconds in between spurts of crawling telling each other, "we'll just crawl to that next rock." That time, there was a train that we could have taken to the top of the mountain but of course the train was of no interest to us. Crawling up a mountain in Zermatt. I am only smiling because we are almost at the top. 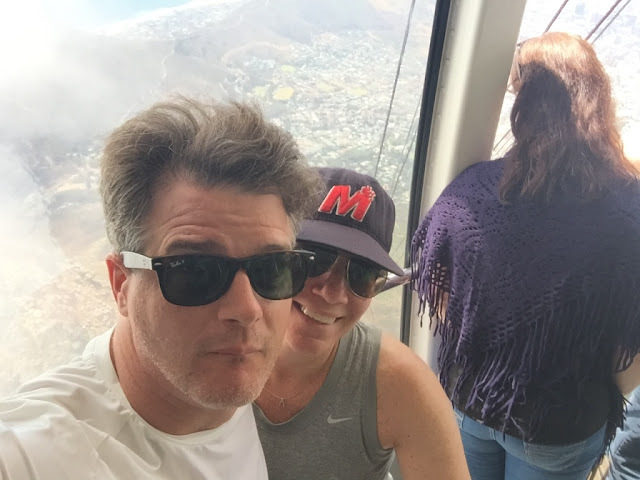 Prior to hiking Table Mountain, Mr. Deep "researched" the trail that we wanted to take. Of course I didn't even bother to look at the map or really listen when he explained the plan to me. Once we arrived, we easily found the trail head and began our hike. But as we went along the trail became more and more difficult to spot. 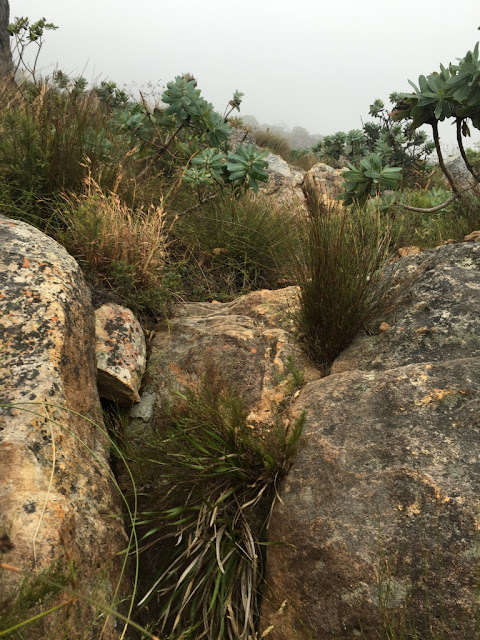 At first we could see some piles of rocks that it seemed were purposely left along the way to mark the trail. But then we wouldn't see any rocks for a while and then it became difficult to tell if the piles of rocks we did see were official piles of rocks or just piles of rocks. At this point we had been hiking for two hours and and had climbed 1200 feet (366 meters.) We kept heading in different directions trying to figure out where we had lost the trail. 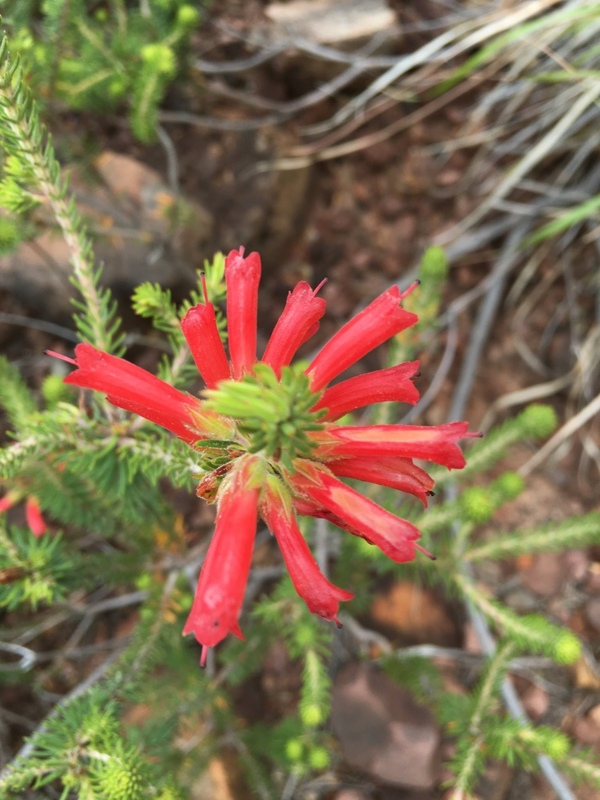 We were not seeing any other hikers or any official trail markings. 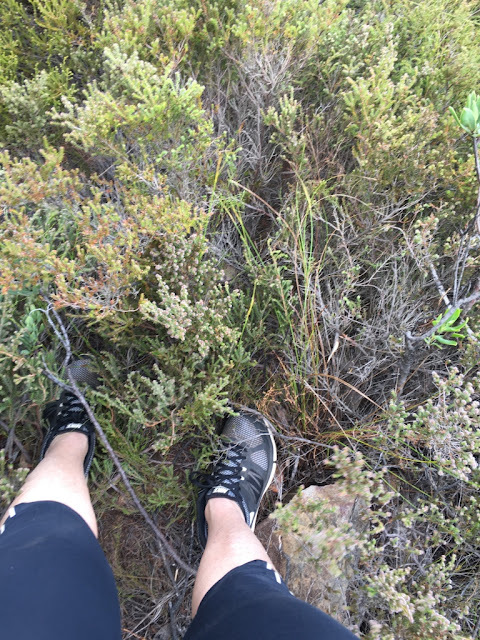 By the way, not seeing other hikers on a trail that's described as popular is a sign of a problem. As we continued searching for the trail, the fog rolled in and suddenly we could no longer see Table Mountain above us or Cape Town below us. We decided to turn around and go back down. 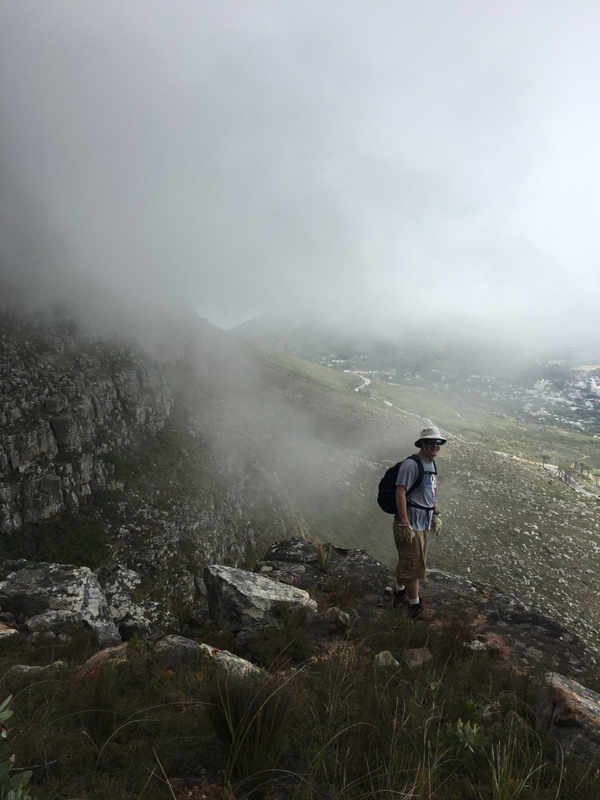 As we began to make our way down the sky started to clear and soon we could again see Cape Town, cars, roads and people. We could even hear people below us talking. We could see the trail that we needed to get back to. But even with all of these signs of civilization we could not figure out how to get back onto the trail. We were so close but yet so far. The problem was that every route that we would take would eventually lead us to some kind of cliff or rock face drop off. 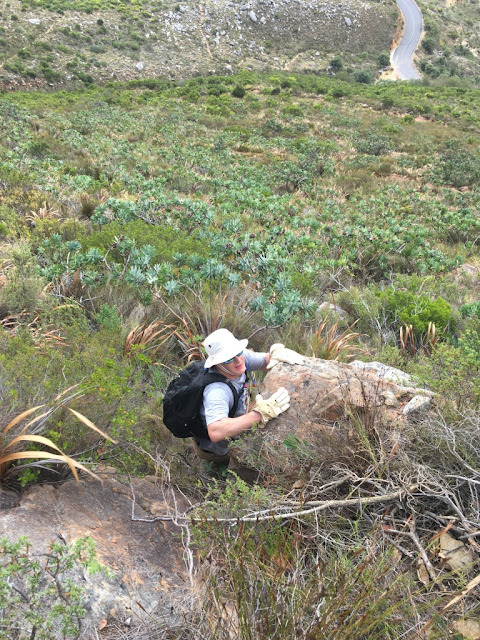 About ten times we chose different directions and eventually would come to a drop off too steep to navigate. I think I now know where the phrase dead end comes from because we were hitting dead ends as in cliffs where if we tried to make our way down we'd likely end up dead. 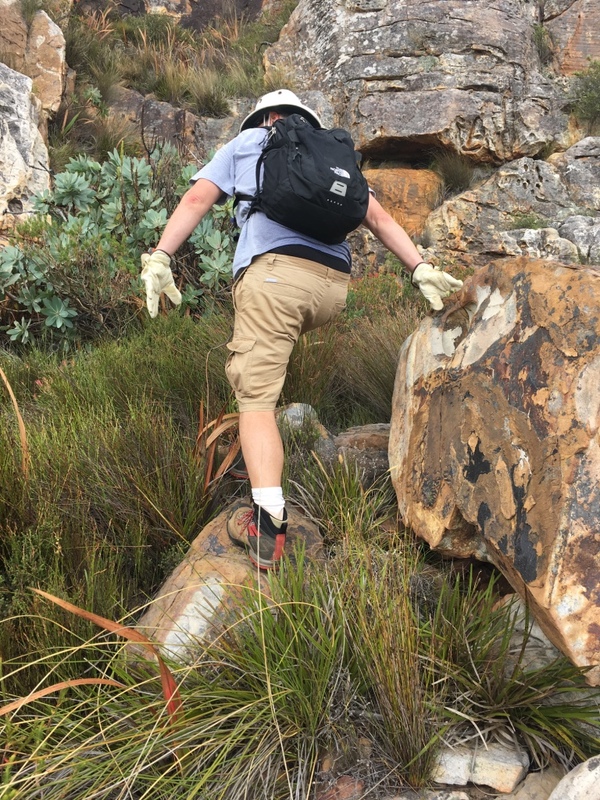 To avoid plunging to death off of a cliff, we had to hike through the brush and through giant prickly shrubs and boulders.The boulders were hidden underneath huge tufts of grass so it was difficult to navigate. Finally after an hour of crawling, sliding on our butts, grasping onto rocks and praying not to step on any snakes (that was all me, I don't think Mr. Deep was worried about that) we were able to get back on the path. There has got to be a way down! I'm so glad I left my good hiking boots at home and just wore regular sneakers! Always prepared, Mr. Deep put on his gloves. See I'm not exaggerating and you can see the road below. These are the cliffs I'm talking about! Finally safely back on the trail! When we were safely on the trail, Mr. Deep turned to me and said, "you know we were in trouble up there right?" I actually wasn't scared once we started to head down because I could see civilization, so I wouldn't say that I knew we were in trouble. Mr. Deep though, felt that we were only moments away from having to call for a rescue. The only thing more horrifying than taking the cable car up, would have been having to call for a rescue. Luckily it didn't come to that. 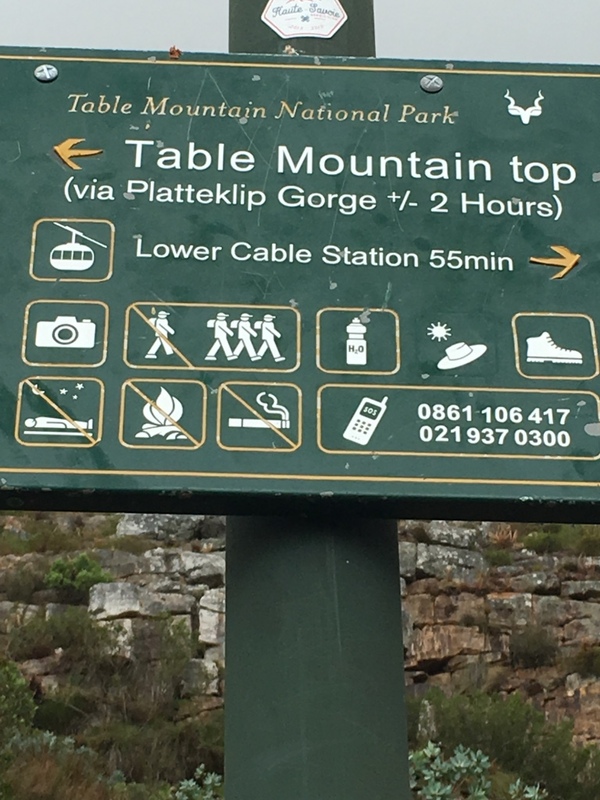 And that is the story of how we didn't visit the top of Table Mountain. 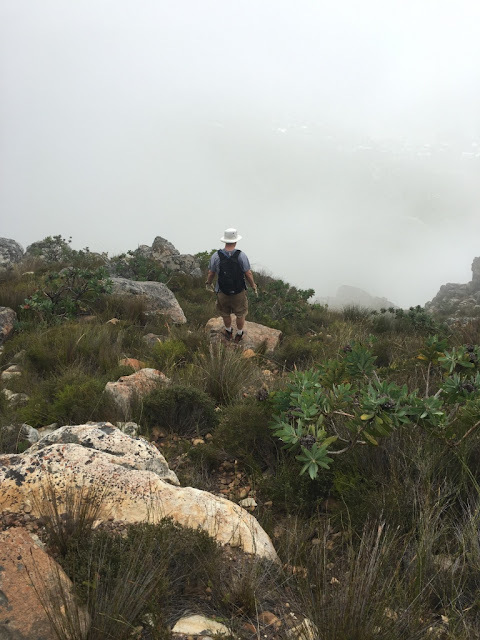 A few days later, after drowning the the sorrows of our failed attempt with lovely wines throughout Stellenbosch, we returned to Cape Town determined to successfully hike up Table Mountain. We had figured out our mistake. In our haste we had what is known as poor reading comprehension and we misread the sign, ignoring the arrow. Instead of correctly reading the sign and noticing the arrow was pointing to the trail head, we thought the sign was marking the head of trail. Notice the arrow. We didn't. Even though we didn't get lost the second time, the hike was really challenging. It took us about 2.5 hours to hike 1.75 miles (2.8km) because we climbed 2500 feet (.762 km) in elevation. It was so steep that we had to stop to rest frequently. There were many other hikers (a good sign that you are actually on a trail) and we kept passing them and then they would pass us as we all alternated climbing and resting. I like being on a trail. When we finally reached the top, the view was spectacular. It was a very clear day which is is not always the case. We could see all of Cape Town and Robben Island. We took the cable car down. Mr. Deep had changed his shirt because the bright yellow one was attracting bugs. Yes, the man keeps a spare shirt in his pack. What a story! I love that you climbed on foot. It's what I would have done, except we would have had to deal with 4 mutinous kids. Which is far worse than losing a trail, trust me.